I found the book an interesting story. Through it I experienced the confusion and strife of King Saul’s home. I felt the conflicting emotions of a young woman who weds the man she loves, only to have him driven away by her father who is possessed by jealousy over David’s popularity with the people. When she and David are reunited, she faces issues like being part of a harem and belonging to a former king’s family. Though her personal ambition, together with the strong, determined personality Smith has given her make her a somewhat unsympathetic character, it seems a realistic interpretation of one of the Bible’s fascinating females. I appreciate the respect with which Smith handles the biblical account. In an author’s note at the end of the book she says, “I have done my best to stay true to Scripture throughout the novel.” In that vein she begins each major division of the story with Bible quotes that foundation the events within the section. Of course her telling adds many details, but I never felt that they were inconsistent with or contradicted the Bible account. 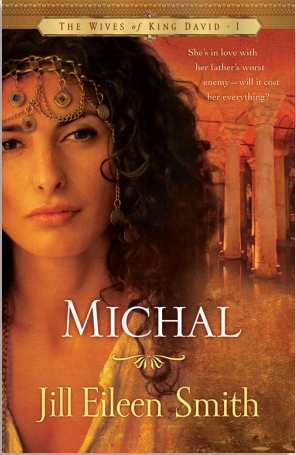 If you’re a fan of biblical fiction, you won’t want to miss Michal. A Bible study based on the book. Publisher: Revell, March, 2009, available in hardcover, paperback & Kindle editions, 383 pages.